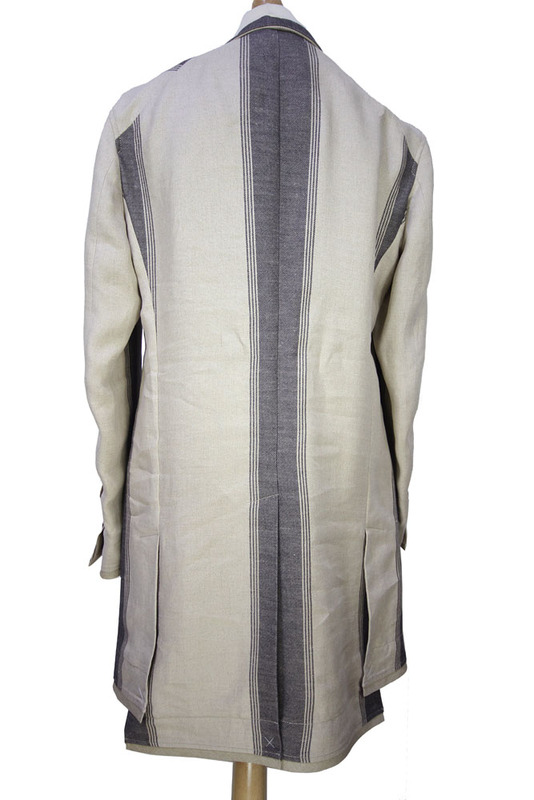 Vivienne Westwood Man linen/cotton mix Striped Asymmetric Coat. Wide stripes. Round neck, double breasted style with 4 button fastening. The coat can be worn fastened up to the neck or with lapels. Stiff linen edging all around. Angled left chest pocket. 2 main pockets with inset detail. Single button working cuffs with stiff linen trim. Triple vent at rear with central panels longer than the side panels. Lined at the front in the same fabric as the main garment and lined at the shoulders in a cotton mix. All seams are taped French seams. 2 inside pockets. A totally stunning Summer coat, highly recommended!